Joseph Bitangcol Found Unconscious Inside His Car! This is the photo of the former Kapamilya actor Joseph Bitangcol which is now creating a buzz in the world-wide web! 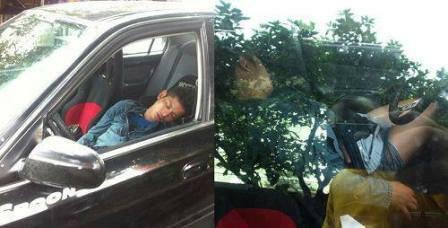 In the photo, Joseph is unconscious, drunk, and half-naked inside his car parked along Marcos Hi-way. Other said, the actor was loaded with a prohibited substance but this was denied! The incident took place weeks ago. Joseph is a product of the Kapamilya artista reality show "Star Circle Quest." He even became the real-life boyfriend of his co-contestant Sandara Park. After ABS-CBN, Joseph transferred to other networks such as in GMA-7 and in TV5.